The REV’IT! Discovery OutDry boots are the 2017 update of the REV’IT! 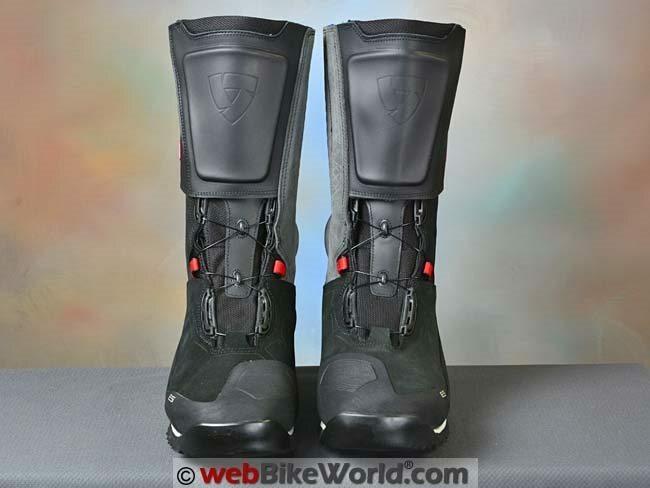 Apache boots we reviewed in 2008. The Discovery boots are also available in a shorter version, the REV’IT! Pioneer OutDry boots. The Discovery OutDry boots are good-looking adventure boots reflecting a go-anywhere, do-anything attitude. And that is an attitude I have now validated. These are feature-rich boots made from an interesting blend of natural and synthetic materials. They are skillfully put together and superbly finished. 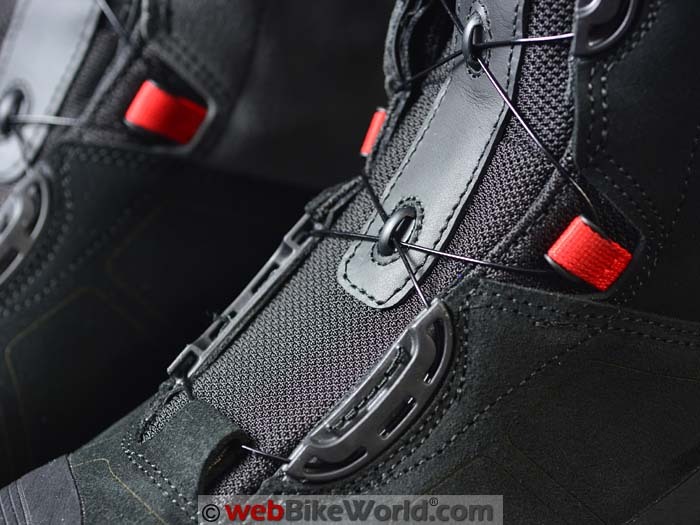 One of the most interesting features of the Discovery OutDry boots is use of the Boa lacing system that has been adopted by a number of motorsports manufacturers. The Boa system can be operated with one hand, activated by the single “dial” that incorporates a reel and a locking ratchet. Push the dial in to engage the system and turn it clockwise to tighten the laces; pull the dial outwards releases the lace tension instantly. The system is flawless in its performance. While design, build and function aren’t issues with the Discovery OutDry footwear, there are indications that sizing runs a bit small, as we (and others) have discovered. If there is any doubt, going up one size is probably the best decision. Regarding build and durability, there are no doubts at all — these things are built to last, while providing optimal support, protection and all-day comfort for the wearer. They’re not inexpensive by any stretch, but the REV’IT! Discovery OutDry boots are an obvious top of the tier product, well worth the investment. OK, its official: I need to expand my boot shelving. 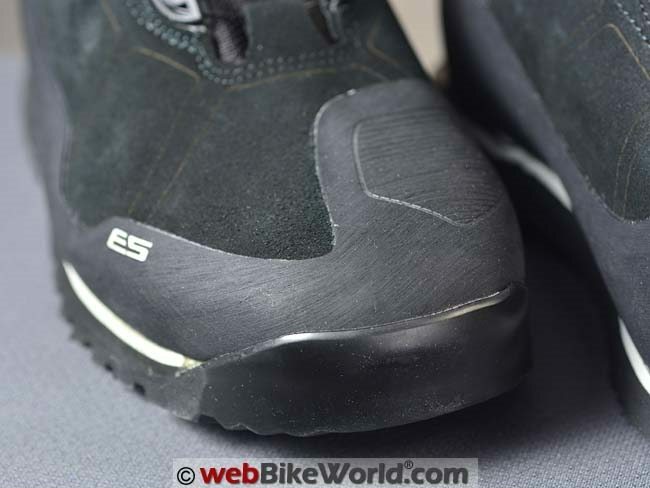 With three new pairs of boots on hand — the SIDI Adventure 2 Gore-Tex (review in progress), a pair of the new REV’IT! Discovery OutDry boots and a pair of SIDI Deep Rain boots, space is (again) at a premium. Or maybe it is once again time to pass on some of the many pairs of adventure and MX boots occupying an inordinate amount of space on my boot racks, shelves and elsewhere. But I digress; back to this review of the REV’IT! Discovery OutDry adventure riding boots. 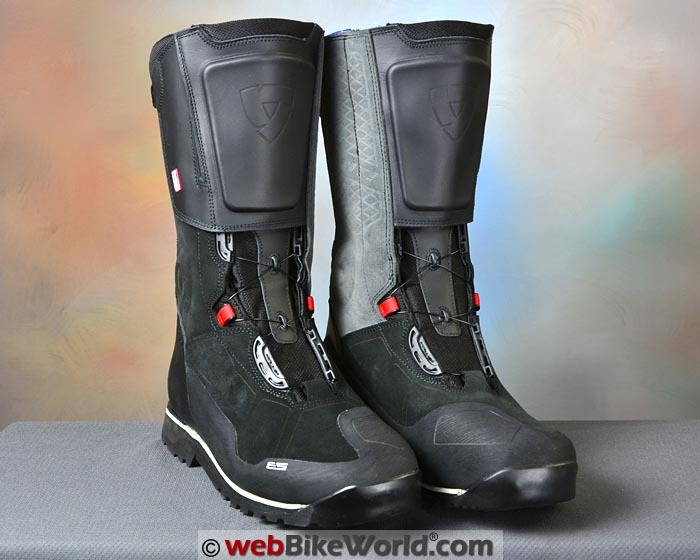 If the Discovery OutDry boots look vaguely familiar, you’re probably thinking of the REV’IT! Apache boots we reviewed exactly 9 years ago to the day. The Apache boots were way ahead of their time, which was reflected in relatively weak sales. But REV’IT! did not give up on the concept of what we called “mashup” boots — a combination of motocross/adventure boots, trail running shoes, race boots and touring boots. Thus, we have the new REV’IT! Discovery OutDry boots for 2017, and for good measure, a double-down bet with a 2/3-size sibling, the REV’IT! Pioneer OutDry boots. Getting a new pair of riding boots always gets me cranked up, increasing the desire to go riding, but more of the winter white stuff had to disappear first. But with that now a memory (but replaced with the wet stuff), riding time is increasing and I’m getting consistent use of the Discovery OutDry boots. In the between-season interim, it was break-in time for the new boots. That allowed me to discover how they rated regarding fit, walking comfort and, of course, how well they protect the feet from that wet stuff (easily tested with this very rainy spring we are experiencing). By coincidence, I have both the REV’IT! 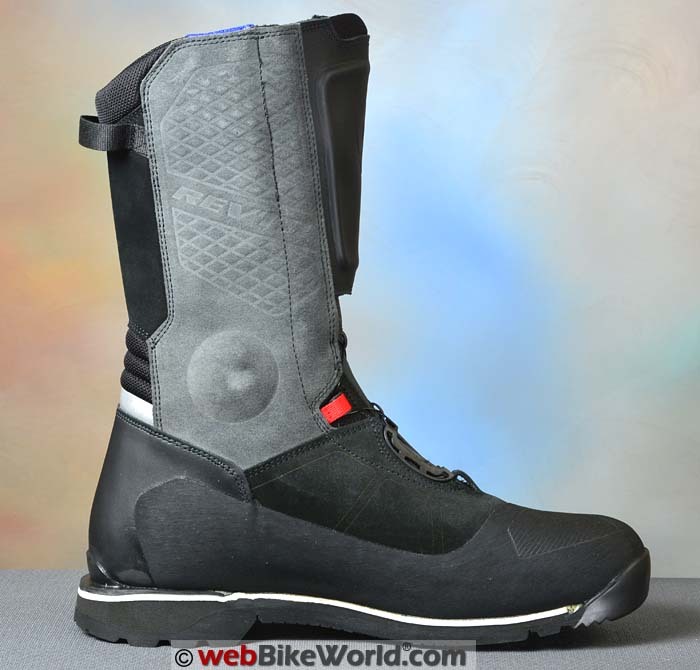 Discovery OutDry boots and the Sidi Adventure 2 Gore-Tex boots to evaluate at the same time. Both are both outstanding representatives of their genre and both take slightly different paths in addressing requirements for this type of protective adventure gear using both proven and new approaches. 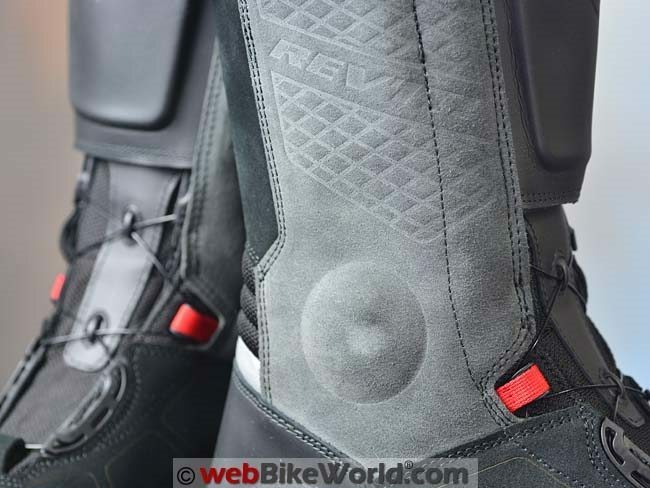 While the natural tendency is to have both sets of boots side-by-side in a no-holds-barred comparo, the REV’IT! boots were first in the queue, so for now we’ll stick with the Discovery OutDry footwear. Like most REV’IT! gear, the Discovery OutDry boots feature lots of technology, both the well-known and the lesser-known types. Overall, the Discovery OutDry boots provide much insight into what an adventure boot needs in 2017, along with a healthy dose of what most of us would call common sense; it all makes for an interesting set of adventure footwear, with a long feature list. The Discovery OutDry boots have more or less the traditional-looking heavy adventure-touring boot look, but the whole of the parts gives the them a distinct style that is an obvious update to the REV’IT! Apache boots (review) of 2008. The good news is that this modern look and feel is validated when putting the Discovery boots into use. 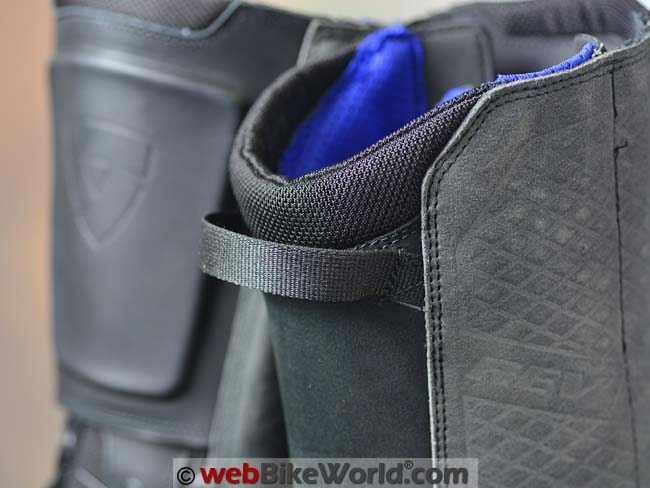 The outer shell or upper is made from a combination of Cordura 500D, but unlike Lorica (synthetic leather) found on other brands of boots, REV’IT! also uses full grain cow hide leather and sueded leather sections for breathability and durability. The texture and porous characteristics of suede leather allows it to quickly absorb liquids (think visor wiper functionality), so moisture doesn’t build up, creating a slippery surface. The leather sections provide natural resistance to virtually everything while acquiring its own character as it wears, something you won’t get with synthetics. 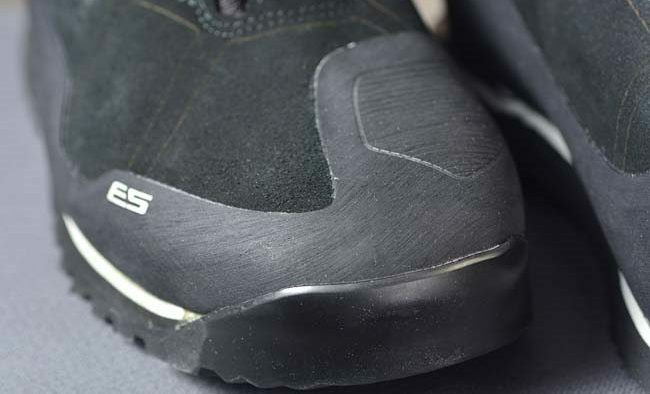 And the final outer layers have sections of rubber, found in the heavy-duty strong flexible absorbent bumper around the bottom edges of the boot and soles and the insert sections like the gear shift pad. This natural and synthetic combination of materials provides a strong, flexible, light weight and stable outer shell that can cope with elemental challenges while enhancing overall fit, comfort, protection and mobility. The waterproof and breathable barrier that is so important in this type of boot is provided by OutDry. This is a patented membrane material used as a one piece insert, heat-bonded directly to the outer layer, which eliminates seams and gaps. To paraphrase the REV’IT! marketing information, OutDry uses a one-piece patented construction that creates a waterproof and breathable barrier. It’s claimed to be an “impenetrable layer” that is heat-bonded directly to the outer fabric of the boot without seams, thus there is no way for water to get in. Also, REV’IT! SEESOFT protectors are used for the shin and tongue inserts. It’s claimed to be a highly impact-resistant blend of Nitrile and Polynorbornene rubber “memory foam” that absorbs and spreads the energy transmitted from impacts. The interior of the Discovery OutDry boots is both comforting and supportive, with silver-ion antibacterial 3D mesh lining using the open-loft approach to enhance breathability. Also, an additional layer controls bacteria oxidization for less odour build-up and that’s good. Contributing much to overall comfort and protection are thermoformed (heat formed) anatomically shaped pieces for the foot bed, ankle areas and toe cap inserts. All are precisely formed and reinforced so the feet are properly positioned and supported. Of particular note is the injected ankle cup, which is precisely shaped and sized for optimum grip. It works extremely well in holding and supporting my relatively narrow (and well-abused) heel and ankle sections. A nicely formed removable polypropylene insole with an integrated shank is another appreciated inclusion. Moving up in the boot, a gusseted tongue with its SEESOFT protective insert is fully stitched to the boot last or sides, serving as the first layer in keeping the elements out. This also provides protection and contributes to the overall encompassing environment for the foot. 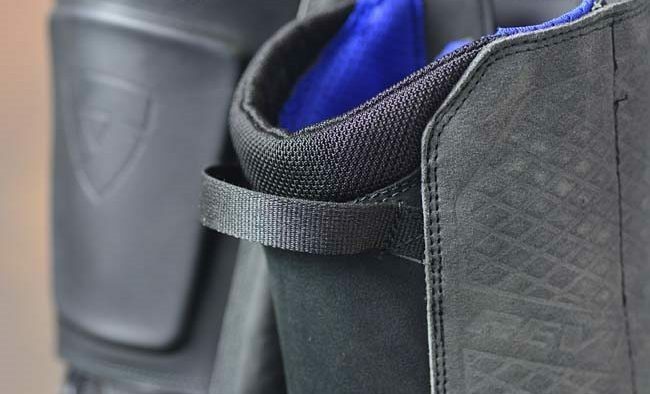 Instead of the more traditional zippers and/or adjustable buckles, the Discovery OutDry boots utilize the Boa Closure System, an interesting and very effective technology-based lacing solution. It is said to be made from aircraft-quality components, including the circular locking dial (reel and locking ratchet), stainless steel laces and hardened injection molded plastic guides. In use, the system is utter simplicity and it has proven to be extremely robust (and it carries a lifetime warranty). More traditional is the adjustable closure flap that covers the Boa lacing system. It’s comprised of a stretch panel at the calf along with a large section of hook-and-loop on the flap, which provides lots of adjustment and a custom fit whether your pants are worn in or out. 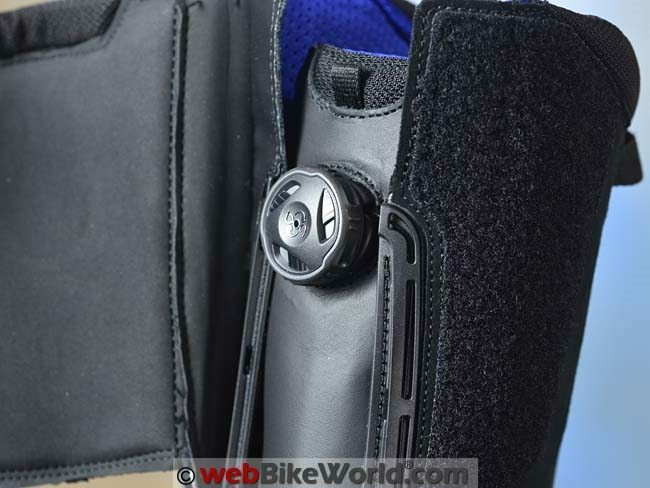 The top of the boot features a comfort collar, which is a nice finishing touch that forms a more complete seal and works to minimize pressure on the calf. 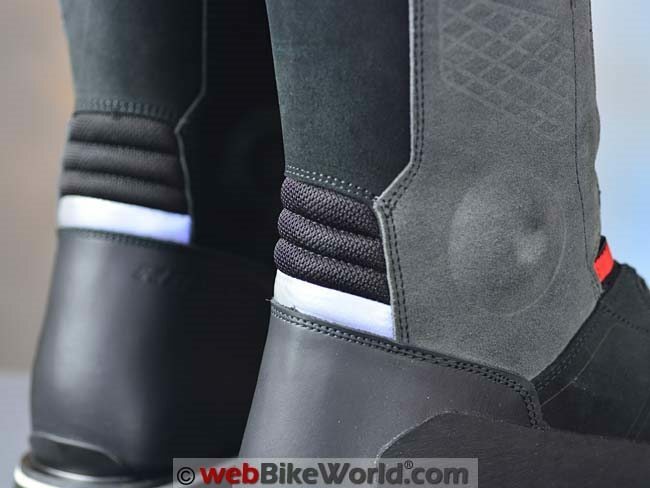 The soles are where the foot pegs and the road interface with the boot and the rider. The soles are covered by the recognized, trusted and replaceable Vibram “Apex” sole. It provides a multi-faceted surface with features for traction, standing and moving on the pegs to support and braking action. And it wouldn’t be a REV’IT! product without a thoughtful detail. A slight upward angle on the back of the heel really facilitates foot positioning and stability when standing on the foot pegs. 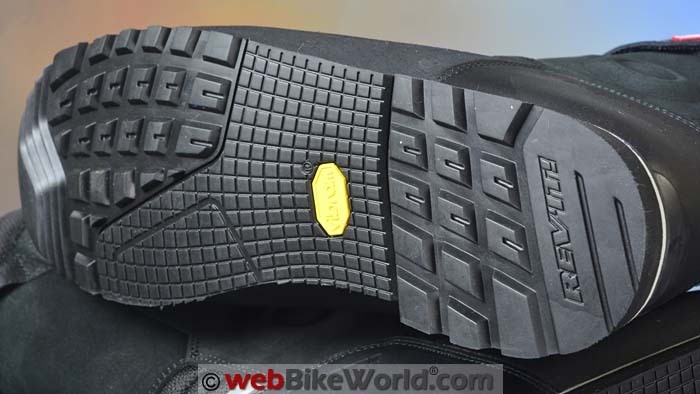 Off the bike, the sole surface is enlarged and grooved at the front providing off the motorcycle walking and hiking comfort and loose surface grip. Also, not forgotten by any means is the composition of the soles, consisting of midsole, shank and outsole components. 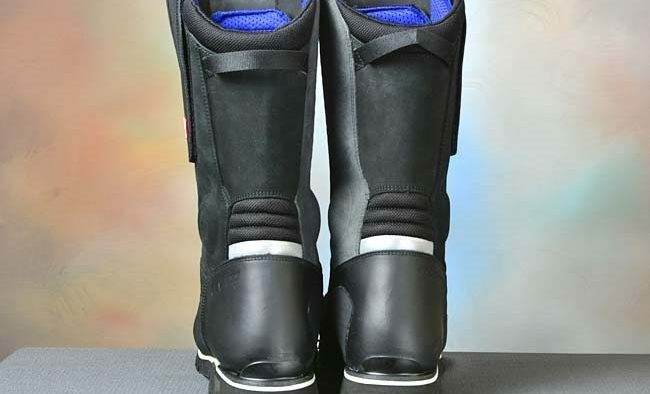 They form an integrated base for strength, support, flexibility and protection, all critical requirements for a multi-role, multi-functional motorcycle boots of this type. 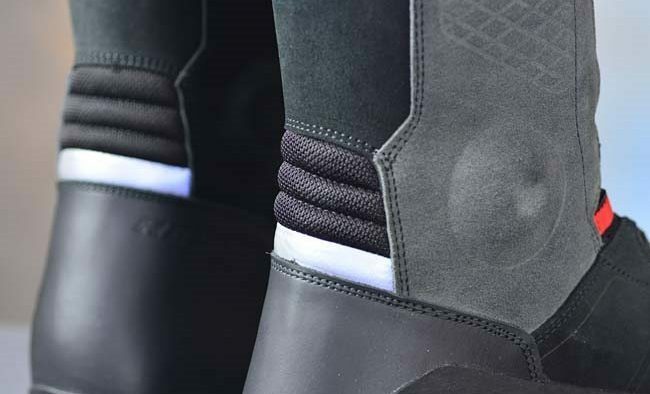 The midsole is the all-important cushioning and protection layer between the boot and the sole. The Discovery OutDry midsole utilizes a multi-density EVA shock-absorbing material to reduce impacts or energy created by riding or walking that are transmitted to the foot and leg. 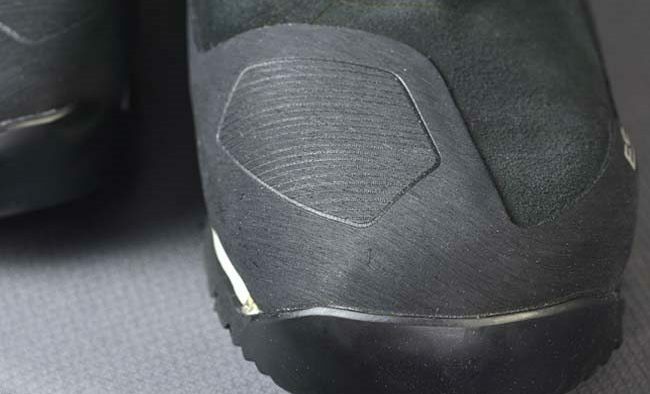 Another important feature found in the midsole and outsole combination is a TPU (thermoplastic urethane) heel cup stabilizer. This allows full length and width extension of the sole for additional stability, coverage and comfort when walking. 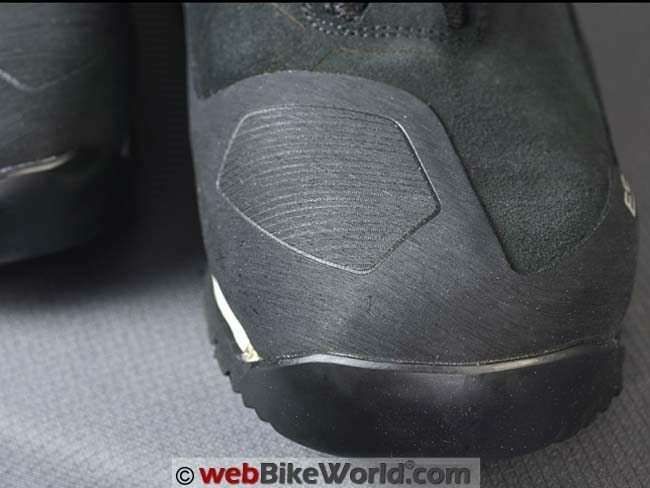 And finally, sections of rubber cover the lower boot, the outer edges and also the shift pad inserts. These all work to provide an effective “bumper” around the parts that are typically the most abused areas of an adventure boot, especially when used off-road. 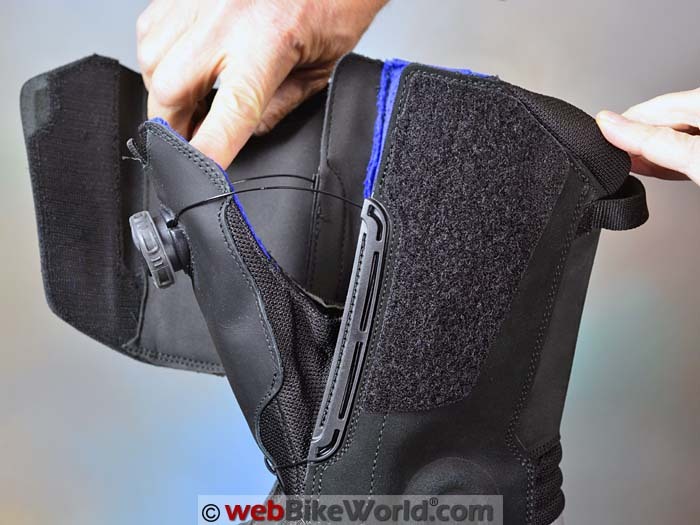 The Boa Closure System is still relatively unique in the motorcycling industry, although it is being adopted or featured among several manufacturers of motorcycle boots and even motorcycle gloves, like the revolutionary Knox Handroid gloves (review). The Boa components include the dial, the stainless steel laces and the molded lace guides, which are all guaranteed for the lifetime of the product on which they are installed. That’s not surprising if you look at the engineering and quality behind the system. And the Boa system used in the Discovery OutDry boots shows just how versatile, reliable and effective this lacing system can be. Then the Boa dial is released, there are no laces or zippers to open and you won’t need to stretch the entry point for the boots. In practice, the Boa system provides a rapid entry, fast closing perfect fit. It provides a near-infinite amount of “just right” tension with no pressure points and it helps make the boots lighter in weight, which is an important factor with this type of boot. To use the Boa system, pull the boots on, push the dial in to engage the ratchet and turn it clockwise to tighten the laces for the perfect fit, pants in or out. Release the tension on the laces by pulling the dial out and the laces are instantly released. Once locked in place, the Boa reels and long-life stainless steel laces stay tight and secure. The thin and very strong strands also run smoothly along the injected plastic guides. The Boa closure system is never obtrusive in any way and it virtually disappears once the expanding closure flap on the boots is closed. 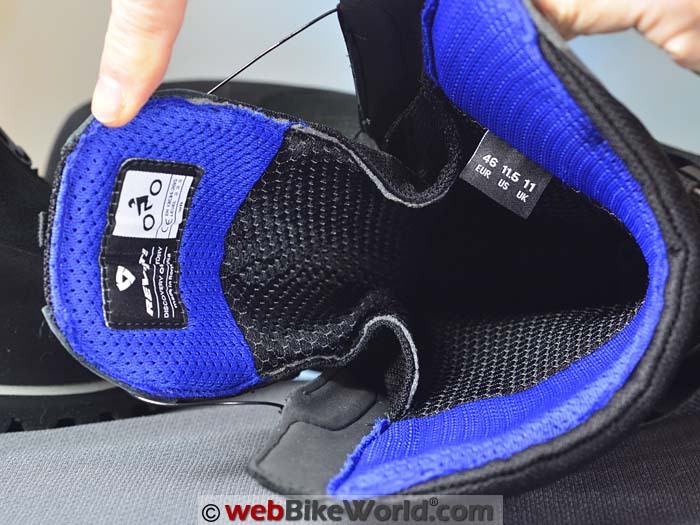 Between the cut of the upper boot panels and the Boa lacing system, entry into the boots is very easy, especially with the large sturdy webbed pull tabs on the upper back of the boots. And with the Boa lacing system released, removing the boots is simple, a feature that is always appreciated after a long day in the saddle. And now that we’ve managed to get the boots on and tightened, we come to what is probably the most subjective part of any review: fit, sizing and resultant comfort. I ordered the Euro size 46 (USA 12), based on previous experience and the REV’IT! Footwear Sizing Chart. Euro 46 is the boot size I have been wearing all my young to aging adult life, without issue. 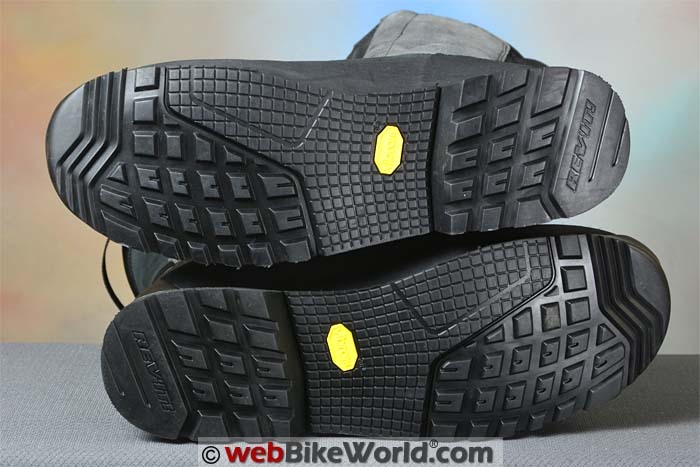 Anything in size 46 footwear is typically good to go for me, with fore/aft and overhead wiggle room allowing air movement and toe wiggling for blood circulation, all of which is important during long days on and off the motorcycle. But in the Discovery OutDry boots, my size 46 feet, in a medium weight wicking pair of socks are comfortably accommodated in all categories, but my toes are squeezed a bit, by about one half size in my estimation. This is slightly puzzling, because it has been a long (long) time since a pair of size 46 boots didn’t fit me, even as age takes its toll. After exchanging the well-shaped and supportive removable insoles for a pair of Dr. Scholl’s Massaging Gel Ultra-Thin insoles and switching to a light-weight sock, the issue is partially mitigated thanks to a wee bit of space gained. But even with this size issue factored in, it is still hard to be negative about the situation and the boots in general. Why? Because the Discovery OutDry boots are so well made and comfortable in virtually every other way. 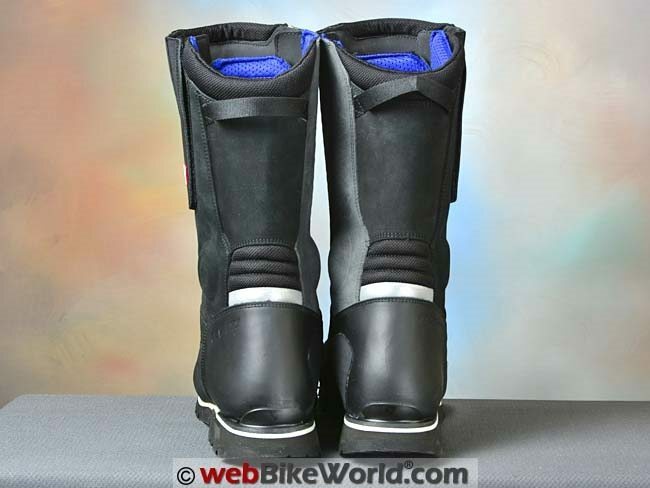 Wearing them for roughly ten hours on the motorcycle, mostly seated but with some prolonged standing on the foot pegs proves just how supportive, protective and comfortable these boots remain hour after hour. Off the motorcycle, walking is OK, but prolonged periods or long hikes aren’t as comfortable due to the sizing issue for me. I have no doubts that a size 47 would eliminate the problem. With the passage of time and use, nothing else has been an issue. There are no pressure points or overly constrictive areas in the boots. The boots are indeed breaking in nicely and might even exhibit a bit of character in a year or two…these things are built to last. Bottom line regarding fitment: if you wear other brands, take the time to try these on first if possible and if you’re at the upper end of your size or if you have any doubts, you may want to go up one size for long-term comfort. The Bucket Test? I tested the water resistance in a large tub; in a drainage ditch filled with what felt like glacier-cooled water and in a deep large scooter-swallowing pothole. None of those has allowed so much as a drop of the wet stuff to penetrate the boots. 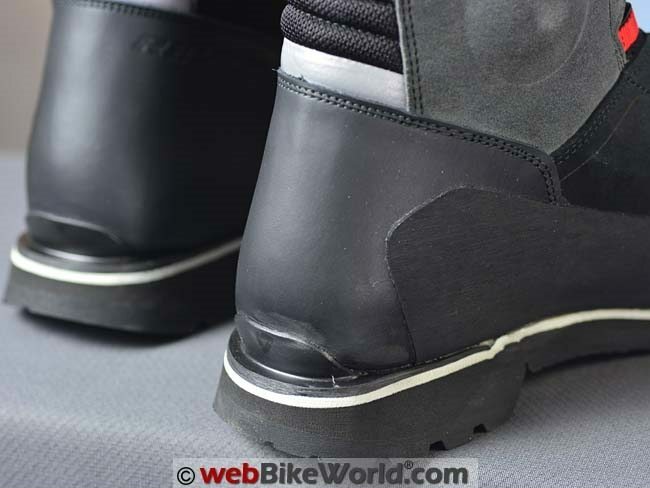 And even riding at speed in a heavy driving rain — something that often defeats even the best waterproofing schemes — hasn’t overcome the OutDry insert. It doesn’t seem to breathe quite the same as Gore-Tex, but it sure passes the waterproof requirement. As a follow-up, after almost two days of slogging the dirt and muddy roads recently on my new BMW R 1200 GS Rallye, the Discovery OutDry boots continue to come through with flying colours. They’re supportive, comfortable and most of all, absolutely water-tight. In fact, the only seepage was when the water depth exceeded the height of boots (I had my pants tucked in for a test)! Other than the sizing issue, related to the size chart used by REV’IT!, which by itself is a lesson learned on my part, there is nothing negative to say about the Discovery OutDry boots. 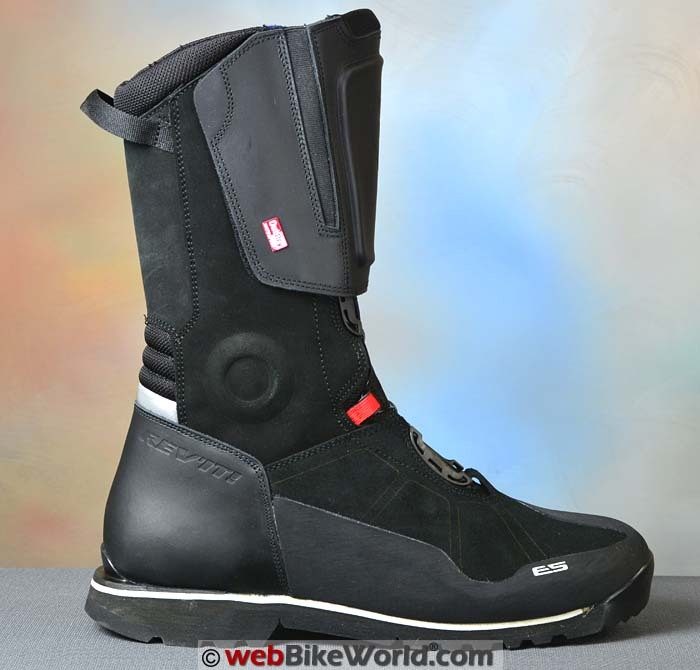 If I had the same foot length clearance in these boots that I have in my long-term favourite Sidi boots, the Discovery OutDry boots would be stiff competition in every category, they are that good. Their sturdy rough-and-ready appearance makes for a visually appealing pair of boots and a closer inspection reveals that a lot of insight, care and attention went into their production. 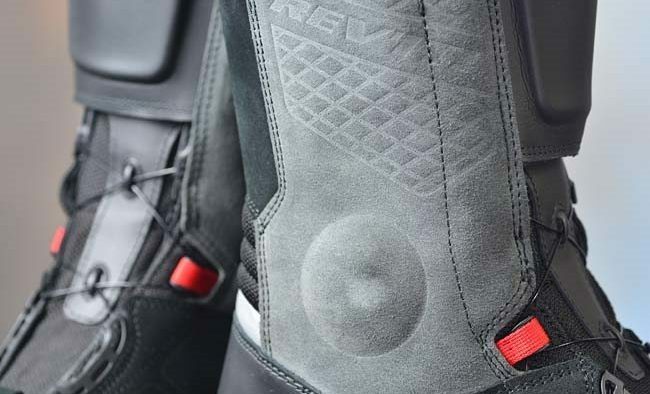 The Boa lacing system and the mix of traditional and innovative features, along with the use of both natural and synthetic materials, make the REV’IT! Discovery OutDry boots stand out. 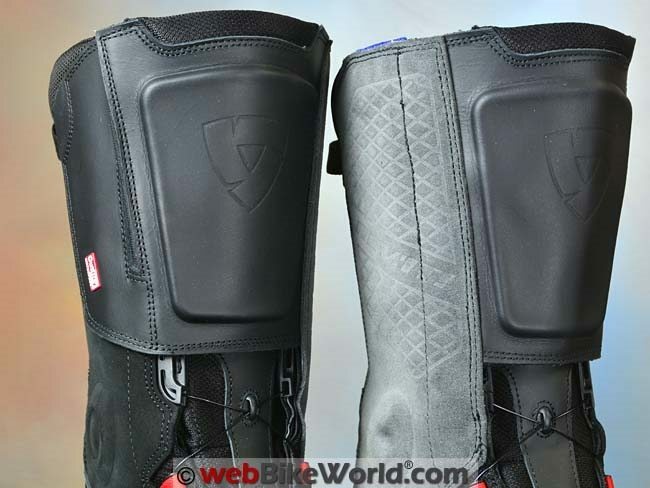 The ability to use these boots for any type of riding and in particular for roaming through the rough stuff with your feet, ankles and lower calves well protected is all good. Along with the “Bucket Test” results, the overall score is Elements = 0 and the Discovery OutDry boots = 1. Of course, keeping your body parts totally dry during a rain storm or when traversing deep wet gouges is mandatory for maintaining comfort and confidence levels, which contribute to peace of mind and riding safety. If my use so far is any indication, these boots are going to last a long, long time, which will also mean that the significant up-front investment will become a wise investment in good gear that is also insurance for the body. Thank you for the most honest and well-detailed review I’ve come across for this particular boot!! I’ve been doing quite a bit of research to find a great dual sport boot that isn’t aggressively ugly with 4-5 buckles and is preferable waterproof. I love the design of this boot and everything it has to offer. My only question (and this is the same question I have for every boot) is how tall is the boot? I realize the height is going to differ by size, but it would be great to know for comparison how much shin protection you are getting with this boot. Even when I go to the brand website(s) for the boots I’m interested in trying, every technical spec is given…except for the height of the boots. I am looking for good shin protection, but I also incorporate shin guards. I am a 5’9″ female; size 41 EU. I have ordered the Forma Adventure, 14.5″ tall, the Forma Boulder, 14″ tall and the Fox Comp 5 2018, 16″ tall.